Several shade tree species are susceptible to Verticillium Wilt. Maples are quite susceptible. Ash, catalpa, golden rain tree, smoke tree, magnolia, and redbud, and others can also be affected. Susceptible shrubs include barberry, boxwood, dogwood, lilac, spirea, weigela, and viburnum. 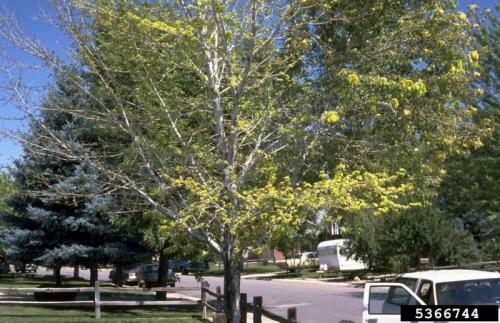 Verticillium is not extremely aggressive but can be a problem on stressed trees and shrubs. Samples that have tested positive for the disease in the Plant Disease Clinic this year include green ash, maple, and catalpa. The fungus Verticillium is found in the soil. After the roots of susceptible trees are invaded, the fungus moves into the vascular system. Trees may show yellowing, wilting, and drying of leaves in the top branches, or sometimes the entire crown. Leaves usually remain attached for a time before dropping off. If the bark is scraped away on wilted branches, you can sometimes see a green to brown streaking, although this is not always apparent. For confirmation, laboratory isolation is necessary. For a laboratory assay, several freshly wilted branch segments about 6 inches long and approximately 1/4 to up 1-inch diameter are needed. The fungus cannot be isolated from dead or dried branches. Diagnosing vascular pathogens are challenging see the vascular wilt article for more information on how to collect and submit samples to our clinic. The Iowa State University Plant and Insect Diagnostic Clinic can help you to investigate and confirm if you plant has this disease. Please see our website for current forms, fees, and instructions on collecting and packing samples. Contact information for each states diagnostic laboratory for U.S. residents can be located on the NPDN website. If you have a sample from outside of Iowa, please DO NOT submit it to the Plant and Insect Diagnostic Clinic without contacting us. Follow these instructions as much as possible. Select 3 to 6 living branches from the symptomatic area in a tree. Select branches with leaves, sending symptomatic leaves (bronzing) is a bonus, we do not test the leaves, but it gives important diagnostic information. Select branches up to 1 inch in diameter and 6 to 12 inches in length. If the samples are left in the truck or on the house porch for a couple of hours the chances of recovering the pathogen significantly decrease. If day temperatures are the 90s, try to keep the sample cool have a styrofoam chest with cold packs or ice bags. We have some free at the clinic if you want to pick one up. Collect the sample only when you can either deliver it directly to the PID Clinic right away or to send it overnight (never on a Friday!). 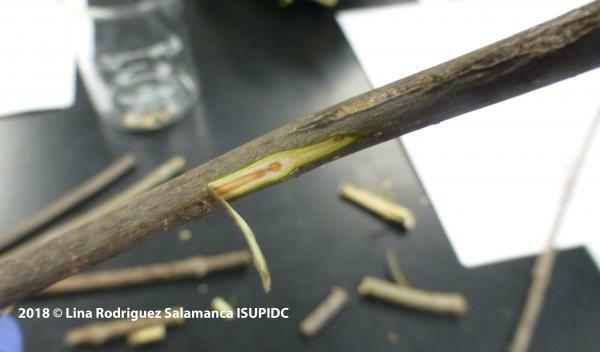 Verticillium may completely kill the tree or shrub in one growing season or cause damage to only a part of the plant. Sometimes an actively growing plant can wall off the invasion of the fungus and can survive for several years. Water infected trees or shrubs regularly to reduce stress. Dead branches should be pruned, but be sure to disinfect (such as with a 10% household bleach solution) pruning tools between cuts. Since the pathogen is soilborne, once Verticillium wilt has been confirmed on a tree or shrub, careful consideration of the type of tree or shrub to be planted in the location is needed. See "Table 2. Plants resistant or susceptible to Verticillium wilt" of the APS resource "Verticillium wilt". Other problems which can be confused with Verticillium wilt include girdling roots, soil-applied herbicide damage, or root injury. For more information see this bulletin for more information about Verticillium wilt. The leaves on my maple tree are covered with a black, sooty material. What is it and is it harming the tree? There are white, fuzzy objects on the branches of my maple tree. Are they harming the tree?